CM Comment: Trying to figure out this twitter, micro-blogging thing? Watch this video from the very popular In Plain English series. CM Comment: Harrah's looking to make acquisitions in the online-gaming sector? Definitely something worth keeping an eye on. April 12, 2009: from The Sunday Times -- Harrah's is to install Mitch Garber, a former chief executive of Party Gaming, as the head of a new company formed to house its internet operations and the popular World Series of Poker. The gaming giant is spinning these businesses out into a newly-created entity. The move is likely to fuel speculation over the possibility of Harrah's making acquisitions in the online-gaming sector. Many observers think it is simply a matter of time before online gambling is legalized in the U.S.
CM Comment: This article conains a lot of very useful usage data on all of the major social networking sites. Click-thru to the full story on the link below for all of the details. April 12, 2009: summarized from Social Computing Journal -- Social Networks are among the most powerful examples of socialized media. They create a dynamic ecosystem that incubates and nurtures relationships between people and the content they create and share. As these communities permeate and reshape our lifestyle and how we communicate with one another, we're involuntarily forcing advertisers and marketers to rapidly evolve how they vie for our attention. Facebook, MySpace, Twitter, Yelp, and other online communities transformed the regimen and practice of marketing "at" people into an opportunity to engage and interact with us, on our terms. It is the zeitgeist of socialized media and it's manifesting into an obsession for branding, advertising, "viral," marketing, and communications experts and professionals worldwide. As marketers, it's your responsibility to peel back the layers of each network to observe and eventually interact with the very people you wish to reach. Each network possesses a vibrant culture and ecosystem that is powered by context and connected by influential social graphs. While nothing beats anthropological fieldwork and observation, let's take a look at numbers behind the top social networks to get a better picture of network engagement and user demographics. Remember, it's how you interpret these numbers combined with an understanding of the real world needs and experiences of the people you're attempting to engage that determines the success or failure of your social media program. They are not demographics, they are not statistics, they are not avatars, nor are they waiting with baited breath for you to friend or market at them and their network friends. This data represents whole numbers and is not representative of the individuals that are looking for resources and guidance, and in turn, will help you participate as a community member, and not as a traditional marketer. CM Comment: Some more stats ... this time a glimpse into Facebook's rapid penetration of the babyboom demographic. 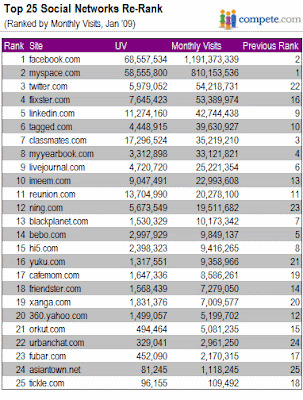 April 14, 2009: summarized from ClickZ -- By now, you've probably heard that Facebook has exceeded 200 million users. Clearly social media is exploding and the stats aren't just unprecedented, they're mind-blowing! To demonstrate this, I did a some stat research this weekend to share with you here. Facebook is growing like crazy, with over 500,000 new users per day. On January 7, 2009, Zuckerberg posted on the Facebook blog that Facebook had reached 150 million users. On April 12, he posted that it had reached 200 million. That's 549,450 new users per day! 45 percent of Facebook's U.S. audience is now 26 years old or older. Facebook is growing in every age/gender demographic. The fastest growing segment? Women over 55, up 175.3 percent in the last 120 days. 8 percent of Facebook's users, roughly 16 million people, are over 45, and 3 percent (roughly 6 million people), are over 55. This is a huge quantity of online-savvy boomers and seniors who can be targeted with pinpoint accuracy. In addition, according to "Facebook is Your Father's (and Mother's) Social Network" in "Wired" magazine, the biggest growth in terms of absolute new users over the last six month are people 35 to 44. Compared to September 2008, over 4 million more U.S. women aged 35 to 44 and nearly 3 million more U.S. men aged 35 to 44 used Facebook in March 2009. Why is Facebook growing so fast with older people? Two reasons: First, for the same reason it's growing with other age groups. People want to connect with friends new and old. Second, and more important, is that people can connect and stay connected with their kids and what they're up to. April 16, 2009: summarized from Advertising Age -- As I speak with companies that want to engage with their customers in the online social world, I continually find people confused as soon as they begin talking about "social media." The reason is the baggage that comes along with the word "media." Here are some words you can use to think more clearly. If you want to build an environment where consumers or other customers connect with you and each other, call it a "social application." It could be a community, a user-generated-content site, or even adding ratings and reviews to your site. By calling these applications, you remind yourself that 1) it's going to take some effort to build it right, and 2) people will interact with it. And you may even remind yourself that 3) it could last a long time, rather than coming and going quickly as advertising campaigns and media do. If you're going to participate in a big social site (Facebook, MySpace, Twitter, YouTube), call it a "social-network site" (or just a "social network," for short). And you're often better off with a channel or a profile or an identity than an ad in such an environment. But no matter what you do, the sooner you stop thinking of the social web as media, the better off you are.